QUEEN was straining at the boundaries of hard rock and heavy metal on «Sheer Heart Attack», but they broke down all the barricades on «A Night at the Opera», a self-consciously ridiculous and overblown hard rock masterpiece. 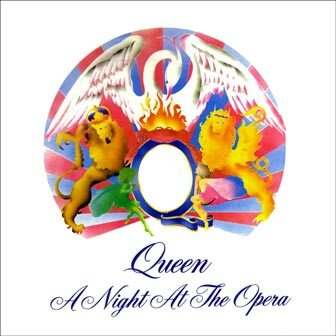 Using the multi-layered guitars of its predecessor as a foundation, «A Night at the Opera» encompasses metal («Death on Two Legs», «Sweet Lady»), pop (the lovely, shimmering «You're My Best Friend»), campy British music-hall («Lazing on a Sunday Afternoon», «Seaside Rendezvous») and mystical prog-rock («'39», «The Prophet's Song»), eventually bringing it all together on the pseudo-operatic "Bohemian Rhapsody." In short, it's a lot like QUEEN's own version of «Led Zeppelin IV», but where Zep finds dark menace in their bombast, QUEEN celebrates its own pomposity. No one in the band takes anything too seriously, otherwise the arrangements wouldn't be as ludicrously exaggerated as they are. But the appeal — and the influence — of «A Night at the Opera» is in its detailed, meticulous productions. It's prog-rock with a sense of humor as well as dynamics, and QUEEN never bettered their approach anywhere else. — Stephen Thomas Erlewine. Do you feel good — Feel good! Don't take it away from me because you don't know — what it means to me. I will be there by your side to remind you how I still love you — still love you. We'd play all day and Sally J.